Biosilk Silk Therapy Reviews | Does Biosilk Silk Therapy Work? Dealing with damaged hair can be very frustrating, especially when you want to keep styling it with heated tools. Unfortunately, the continuous use of curling irons and hot combs will take a cumulative effect on your hair, drying it out and making it more brittle and prone to breakage. Continually dying you hair can also render it rather lifeless, which is why so many women are eager to find a product that will not only replenish the hair, but shield it from future abuse. 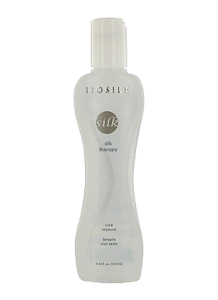 Biosilk Silk Therapy is one such product that claims to restore hair to its natural health, while promoting a silky sheen and continued durability. Biosilk products are fairly easy to find, and you can get them at most beauty and cosmetic stores like Ulta. Target also sells Biosilk, and has even offered discount bundles of the product with other items. You can also find it from online retailers like Amazon.com. Does Biosilk Therapy Work to Treat Damaged Hair? Many people have raved about their positive results with Biosilk Silk Therapy, but this can be attributed to customers using it on hair that is already quite healthy to begin with. The effects are more dubious on damaged hair, particularly with the newest iteration of the formula. Customers have complained of the product's higher concentrations of alcohol, attributing it to actually drying their hair out more, rather than making it more hydrated. It seems that while Biosilk Silk Therapy may have been effective in the past, the brand has decidedly shifted in quality, and its effectiveness is askew as a result. It is not recommended that the product be used as a preventative tool for heat damage, and if you need treatment for dry, brittle hair, it's important to consider other options before investing in this particular Biosilk formula. Alcohol is found in a variety of cosmetic products, including fixatives like hair spray. While it won't necessarily act to dry out your hair, it won't offer any conditioning properties either. Instead of concentrating moisture into the hair shaft, the alcohol will quickly evaporate off the hair, leaving it in the same, unquenched state. If your hair is already quite luscious and smooth, you may find something to like about Biosilk Silk Therapy. However, as a treatment for damaged hair, it falls short, and will likely not live up to the results you pine for. In order to get the best results for damaged hair, it's best to take a comprehensive approach and nourish your hair from within. Try maintaining a healthier diet that is enriched in nutritious fats that will lubricate your hair, and vitamins and minerals will keep the hair shaft strong. In extreme cases, you may have to cut off your hair and nurture the new growth. However, products that incorporate natural oils derived from plants can go a long way towards locking in moisture and sealing the hair shaft from damage. If you're interested in finding the best treatments for damaged hair, compare products here.